On our way to the lovely Lodge at Pico Bonito on the edge of Pico Bonito National Park in northern Honduras, Robert Gallardo, the organizer of the Mesoamerican Birding Festival and the post-festival familiarity trip that I am currently experiencing, let us all know that a Great Potoo (Nyctibius grandis) had been roosting along the side of the entrance road. 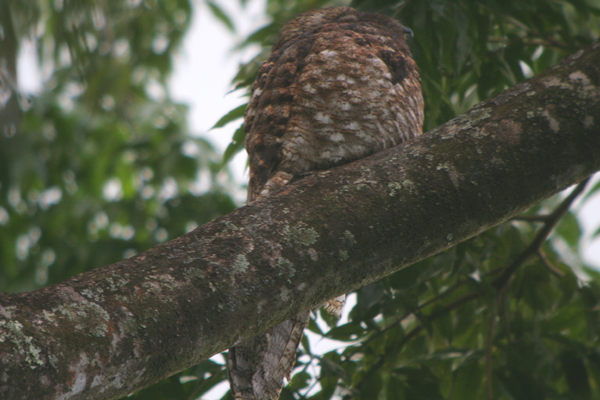 Of course, this got us all excited as only birders can get when the largest potoo (or member of the order Caprimulgiforms, for that matter) is a possibility. Rather than risk missing it, we decided to stop and see the amazing and bizarre bird as soon as possible, which was on the ride in to the lodge. At first the potoo didn’t do much, but eventually it scratched its head with its foot, which doesn’t sound very exciting I’m sure, but it set off a wave of excitement among us birders. It was one of five lifers I picked up on the brief fifteen minute stop, but you’ll have to wait until later to hear about the rest. In the meantime, enjoy another, rather heavily cropped shot, of the Great Potoo which shows the three, count ’em, three, notches in its eyelids which allow the potoo to see without opening its eyes and giving away its position. This post was originally published on 09 March 2009, but we hate to keep posts this good buried in the archives! Dag, I want to see a Great Potoo! I am seriously, seriously jealous. I have not seen this family yet. I didn’t know about the notches – is that for real? That is one crazy-looking bird. Congrats on spotting it! 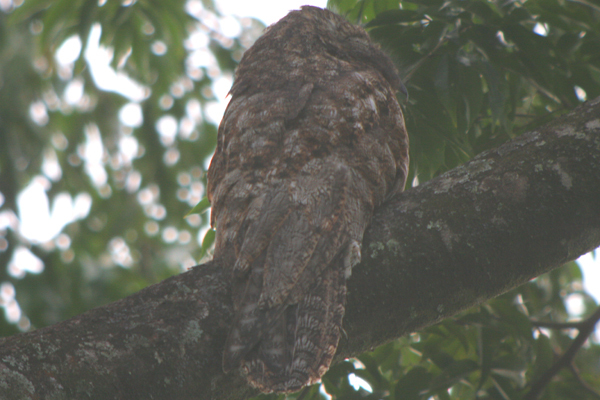 Potoos never cease to amaze me – so mysterious. I had one of these squawk right behind my head a couple years back in Venezuela – scared the crap out of me. It’s vocalization has an eery humanlike quality to it. That’s a notch on your birding gunstock, Corey. What a treat it was to bird with you in Honduras. I’ll really enjoy reliving it through your enthusiastic eyes. @Daniel, Mike, and Nick: Seriously a great bird…and I hope you all see one soon! @Picusblog: It was HUGE! I could hardy believe such a bird existed! @Austin Mohr: Yes, yes it was. @Beth in NYC: Thanks, thought the credit should go to the guides at Pico Bonito who found its roost and to Robert Gallardo, the organizer of the festival and familiarity trip, who made sure we knew where to look. @Matthew Halley: They are mysterious. And though the bird did not vocalize I did hear a tape and it is an unbelievable sound they make. @Julie: Notch! I can’t believe I couldn’t think of that word (for those who weren’t there my first draft of this post used the phrase “hole in its eyelids” because for some reason the word “notch” escaped me). And it was certainly a pleasure birding with you too! Nice shots of this one! I especially love the close up of the head. These giant camouflaged creatures are actually fairly common in the right habitat but are always soooo tough to find. The left-overs. 10 birds that didn’t make it onto the blog.